My wife constantly nagging that if I don't play guitar now I don't need so many of them at home. 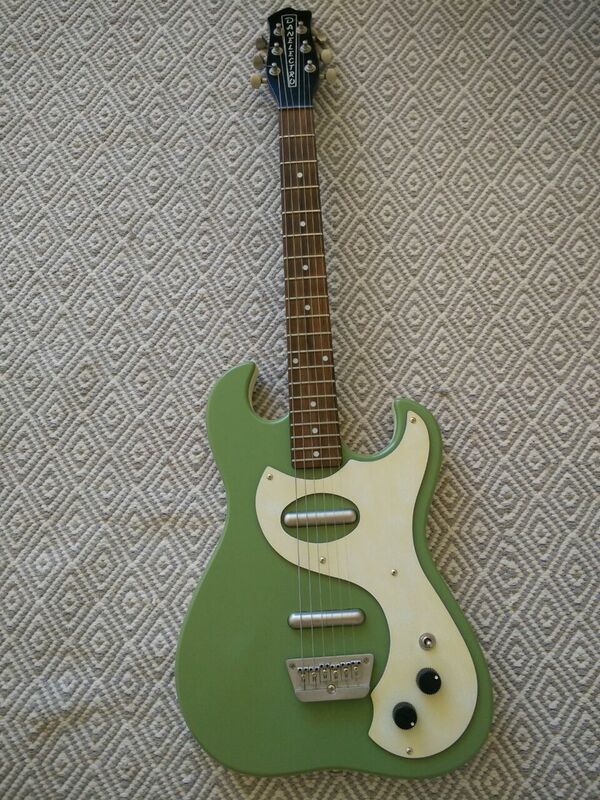 So I was thinking maybe someone will be interested in one that I really loved rehearse with — very light weight and hollowbody Danelectro Dano 63 in rare color Keen Green. I bought this guitar back in 2009 in US, but it seems to be made in 2007 according to the serial number. I've played it until 2010 and since then I stopped gigging because of constant travels. The main reason why this guitar caught my eye (ear?) was the sound. It is twangy and jangly. Comes handy for 60s music, especially surf! Also guitar itself is hollowbody, so it's loud enough for practicing even if you play unplugged. And it's not heavy at all! So it's easy to carry it with you anywhere! I will add basic gig bag and I have several spare string sets if you OK with 9 gauge. Guitar itself is in Åkersberga, but starting from tomorrow I'm going back to work, so I can bring it to Drottninggatan, Stockholm. Which could be more convenient, because SL cancelled all trains to Åkersberga and it takes longer to commute now. I was thinking about price of 2500 SEK which should be about a half of new Dalenectros currently available from Thomann. And definitely we can negotiate it a bit.